He sat with his back against the rocky wall. His glasses were off and cast to the side and I could really see how puffy and swollen his eyes were. With no tissues around, I offered my scarf for his runny nose. His legs were pulled up and he took a small sip from the brown mug that someone had given us. I could see the embarrassment, fear and pain in his face. I wanted to erase it all. I wanted to sweep him up in my arms and cradle him like a baby. I wanted to say that he could just go home and forget all about coming back tonight. But I didn’t do any of that. Wiping his eyes I kissed his not-so-little nose and gave him a hug. Then I sat next to him and just breathed. Through sniffles I could hear his breath calm and feel him relax next to me. He stood up, brushed off his pants and started the walk to class. Parents. Teachers. Students. All wanted to talk to him. All wanted to relive the moment. All needed reassurance. “I am OK,” he kept repeating with a smile on his face. Once we made it to his classroom, all his friends greeted him with hugs and smiles. He made jokes. He smiled. He reassured everyone around him. After changing out of his costume, I thought it best we go home and rest. We got sister out of class and headed home. On the drive he told her the story of how he was onstage in front of the school when everything went purple and sparkly. Once home he stripped down to his underwear, grabbed his panda and sat in the big, comfy chair in the living room. He pulled his favorite blanket tightly around him like a cocoon. “Can we watch Bill Cosby do that Noah joke?” he asked. Sure. 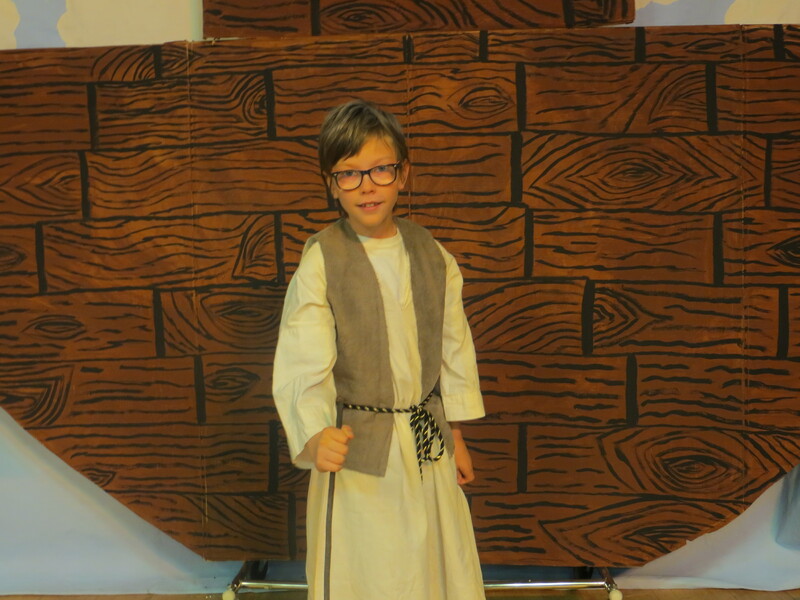 Since being cast as Noah in his class play he was in love with anything Noah’s Ark themed. I scrunched in next to him with the laptop and we listened. Right! Where are ya? What you want? I’ve been good. I want you to build an Ark. We giggled together and I could feel him relax. The big performance was that night and I was honestly petrified for him. It was decided that he passed out because he locked his knees, but I was worried it was nerves. I tried to push all my stuff aside and just be with him. He was clearly sick now. His nose was running constantly and he felt a bit feverish. The afternoon ticked by. We ate some lunch, read a book and colored. He got out a stick he had found at the river and practiced walking around like an old man with his knees bent. I could see the battle raging inside his head. He wanted to call it quits. Give up. Let fear win. But at the same time he was excited and really wanted to do it. What makes the elephant charge his tusk, in the misty mist or the dusky dusk? Courage! What makes the sphinx the seventh wonder? Courage! What makes the dawn come up like thunder? Daddy walked in and he told him the story of the afternoon. We ate a quick meal and headed back to school. His anxiety reached its peak about a block from school. “I think I am sick,” he said between sniffles. He sounded so small and scared. When we arrived, his friends were excited to see him. I walked to the theater and sat with my family. I couldn’t talk to anyone. My hands were shaking. When the show began I thought I might throw-up. Please, please let him be OK. Despite the fever. Despite the runny nose. Despite the fear of passing out again. Despite the embarrassment of the day. Afterward we went out for ice cream. He conquered his fear. He pushed through embarrassment and sickness. He proved to himself that he could do brave things.